Snohomish County Parks is reaching out to trail enthusiasts and interested parties to help with their updated long term trail plans. Parks staff and planners gave a presentation in conjunction with the regular General Meeting of the Trail Coalition of Snohomish County on Thursday March 15 at Willis Tucker Park Administrative offices. There were maps available for visitors to look at and add suggestions. They also give a summary of how projects will get funded. The goal is to provide popular County trails that reach communities and connect to popular recreation areas and destinations. 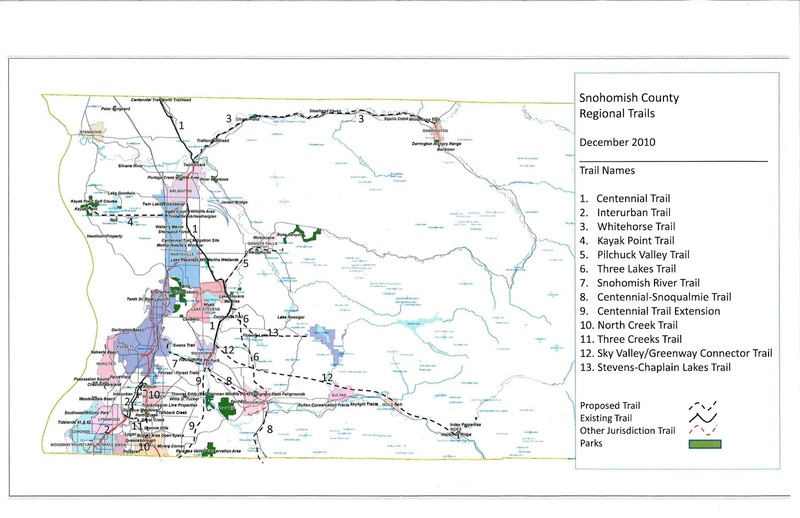 The Parks planners envision a system with the Centennial Trail and the Interurban Trail as primary north-south routes with a ladder of east-west trails connections. One of the key maps is provided below. At this point this is a proposed plan and a doable plan. County Parks would like your input to make it a practical and popular desired plan. This Trail Plan is ambitious and visionary. 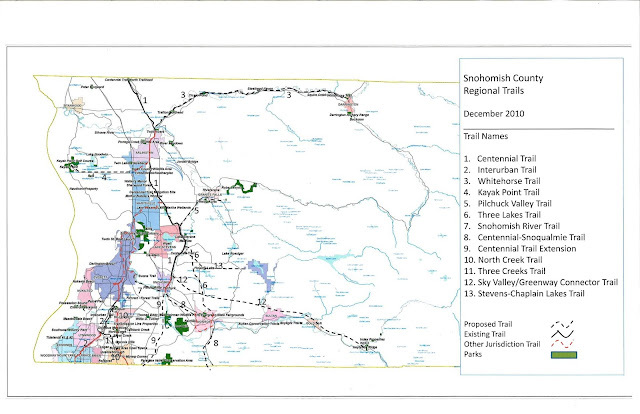 The great success of the Centennial Trail and the continued popular interest in trail connections for both non-motorized commuting, and recreational activities has strong support from the Snohomish County Parks and Snohomish County Council and the towns and communities of the area. Some of these trail plans already have major funding and will see progress this year, such as the Whitehorse Trail and North Creek Trail and a connection between Snohomish and Everett. Other trail ideas are more aspirational such as ideas to connect to Robe Valley and to National Forest areas in the eastern part of the county. Put on your thinking cap and take some time to look at maps. Come to our future meetings and give your ideas and ask more in-depth question if you have them. Our trail coalition is here to advocate for your ideas and facilitate communication between all types of users, land owners, and communities. Our next General Meeting will be at the Snohomish County Parks and Tourism offices next to Willis D. Tucker Community Park, 6705 Puget Park Dr, Snohomish. Thursday June 21st, 5:30 to 7 PM. You are also very welcome to our monthly board meetings listed in the blog post calendar. For more information from Snohomish County Parks on these public outreach meetings please call Principal Planner Sharon Swan at 425-388-6616 or Tom Eksten at 425-388-6606. All of your trail plans and proposals are quite exciting and something to look forward to, but for me at this time having a safe trail to run and ride on between Everett and Snohomish would be my highest priority. Without shoulders I find the River Road just too risky to use at this point. Thank you for your forward thinking. Thanks for the vote for prioritization. We will pass this forward. At the March 15 meeting Snohomish County Planner Tom Eksten specificly ask for creative suggestions to help find a good solution to connect Snohomish and Everett. As we enter into another decade for the Centennial Trail, an on-going request to make the CT ADA accessible is falling on deaf ears. I've proposed an alternative fix for the bollards that greatly impede those on mobility devices, recumbent trikes/tandems, velo's etc., which at this point has resulted in no activity by the county. The alternative is that filing of a federal ADA complaint would expedite those fixes, but at a cost of valuable money resources that could actually be used on the trail proposals.